The SNP government has offered to keep the pound and pay homage to the British monarchy in exchange for control of Scotland’s assets. But with the pound stolen, the obvious retaliation is to end the monarchy and become a republic. But Scottish business, which backs the SNP government, fears a republic will unleash the forces of “people power”. This week has seen the British Establishment step up their war against the SNP government plan for constitutional change to be put to the Scottish people in September 2014. The Prime Minister’s speech at the Olympic Park in East London (February 7 2014) launched the attack by appealing to the people of England, Northern Ireland and Wales to back the Tory government in this struggle by appealing to British patriotism and commending the bloody history of the British Empire. The Chancellor of the Exchequer (February 13 2014) supported by Clegg and Miliband threatened to sabotage the Scottish economy by refusing the option of a currency union in the event of a Yes vote. This ‘united front’ of the three main Establishment (or monarchist) parties is the kind of unity which occurs, as in the Falklands war and the Iraq war, when the political class believe the fundamental interests of the state are at stake. Whatever view we take of the SNP government plan for Scotland there are certain demands which the left in England, Northern Ireland and Wales must support. 1. The right of the Scottish people to self determination. a) The right of the Scottish people to a referendum without threats of economic sabotage or covert action sanctioned under the UK state’s Crown Powers. b) The right of the Scottish people to form an independent sovereign democratic state. We will support those in Scotland who are calling for a democratic republican and internationalist approach to the referendum. We note this approach is being taken by the Radical Independence Conference which is critically supporting a Yes vote in September 2014. We will urge support for this approach by all progressive forces in England, Northern Ireland and Wales. Regardless of the outcome of the referendum organised by the SNP government, we will support those in Scotland who intend to continue the struggle for self determination to secure an independent sovereign democratic social and secular republic with the closest voluntary relations with the people of England, Wales and Ireland. We call on all labour movement, trade unions and socialist organisations in Scotland to support those in England, Northern Ireland and Wales who defend their right to self determination and the sovereign rights of the Scottish people to republican self government. Steve Freeman is a Republican Socialist from England. He recently spoke at the Radical Independence Conference in Glasgow. As Scotland moves towards the 2014 referendum something is stirring in England. People are increasingly distrustful and alienated from the Westminster parliamentary circus. The Crown’s austerity policies and the redistribution of wealth to the super-rich have added to the anger. The following is based on my contribution to the discussion at the Radical Independence Conference held in Glasgow on 16 November with Bernadette McAliskey and Mary McGregor in which I spoke about the future for England. My own political thinking has been shaped by the changing relationship between England and Scotland. I became interested in this in 1978 and came to Scotland and first met Allan Armstrong. We began to co-operate around the debate in the SWP about the 1979 Devolution referendum. It is worth remembering, as a member of the audience reminded me, that although there was a slight majority vote for Devolution it was defeated in parliament by Tam Dayell’s 40% rule. The Callaghan government fell and Thatcher and the Tories came to power and proceeded to shift the political terrain against the working class. Thatcher and neo-liberalism were the real victors of the defeat of Devolution in 1979. It was twenty years before another opportunity arose. Today when Unionist politicians warn of the dire consequences of supporting the SNP plan for Independence we should remember 1979. If the Unionists win the Tories will gain a great boost in authority and this will encourage them to step up their attacks on the working class in Scotland and England. Once the danger to Unionism is safely out of the way it will be ‘no more Mr. Nice Guy’ – like Osborne’s budget announcement of increased investment in Scotland under the Barnett Formula –after a ‘No’ vote this formula will be scrapped. I was back in Scotland in 1997 with the next referendum on a Scottish Parliament and helped Mary McGregor and other comrades do leafleting in Glasgow. It is a great honour to be back again this time on a republican socialist platform with Bernadette and Mary. Next weekend I will be attending the Left Unity conference in England and will bring greetings from Scotland. In 1978 I referred to this at the national question and in 1997 as the Scottish question. Today I think of this as the English question. What are we going to do about England? A largely Scottish audience might be forgiven for thinking this is a problem for the English people. But as internationalists and socialists it has to be seen as ‘our’ problem since it will impact on the working class North and South of the border one way or another. Reactionary forces are more than ready and willing to exploit any division between the people of Scotland and England. ‘We’ have to find a democratic, republican and internationalist answer. England has 57 million people which includes18-20 million workers with 4 million on the minimum wage. The productive power of this section of the people makes the English working class a very important constituency for any progressive movement in Scotland. This is one way in which working class oriented socialists differ from nationalists. Our aim is to build greater unity and solidarity between the working class in England and Scotland and this means recognising that Unionism is a barrier to unity, through its effective denial of democracy and self government. The British ruling class know that the battle to save the Union has to be fought for in Scotland and England. The main Unionist parties, the Tories, Liberal Democrats and Labour, will want to win the support for the idea that we are all ‘better off together’. In fact we are all getting worse off together as the Unionist political system keeps inflation up, cuts taxes for the rich, whilst the employers hold wages down. The present situation is fraught with danger because in England millions of people are unhappy with a parliamentary ‘democracy’ that is failing them. There are two expressions of this disillusionment. On the right the failure or decline of ‘democracy’ is down to foreigners in the guise of the European Union, immigrants, welfare too generous for poor people, and rebellious Scots. UKIP is the party gathering up and reinforcing these views. Nigel Farage, the uncrowned King of Little England, was recently given a big raspberry by Scottish protesters. Fortunately Little Englanders are not the majority. Many are looking at the Scottish Parliament and some of its social democratic policies – no privatisation of the NHS, no student fees, care for the elderly – and wonder whether England could have its own Parliament. In 2011 the Occupy movement organised a protest at St Pauls Cathedral taking up the issue of the City of London and demands for ‘real democracy’. The latest focus for political discontent has been the Russell Brand interview with Jeremy Paxman which gave expression to widespread alienation especially among young people. In looking for an answer Brand stumbles across Oliver Cromwell’s address to the Rump parliament in 1653 when he condemns the House of Commons as a “den of thieves” inhabited by “a pack of mercenary wretches” who would “sell your country for a mess of pottage” and who had “grown odious to the whole nation”. But Brand retreats somewhat when he remembers that Cromwell was no saint himself and had starved and murdered Irish Catholics. Nevertheless an intelligent comedian like Brand is looking at the right period in our history but the wrong time. In 1649 England became a ‘Commonwealth’ or republic. The Levellers, the republican party of the revolution, stood on the brink of creating a democratic state whilst the Diggers began to occupy the land. We need to wind the clock back to the start of the revolution over ten years earlier in Scotland when the Covenanters rose in rebellion against Charles Stuart and defeated his invading army. This triggered a wider rebellion in the English parliament and led to the civil war. In 1644 an army of Scottish Covenanters and Cromwell’s Ironsides joined forces in a united front to defeat the Royalists at the battle of Marston Moor near York. It was one of the decisive turning points of the revolution. For those who may imagine that a Scottish rebellion and a united front with forces in England are confined to the 17th century then look at the Poll Tax. A Scottish movement against the Poll Tax in 1989 joined with progressive forces in England and delivered the fatal blow in the Trafalgar Square Riots which more or less ended Thatcher’s rule. Let us leave our history and return to the present. In England the left remains deeply divided between the Labour Left, the Socialist Party, the SWP and a range of independent socialists and small groups. A new initiative started by a Ken Loach appeal has drawn the Indies and small groups to form Left Unity. Left Unity decided to allow its supporters to present Platforms. It is interesting to examine what was thrown up. It tells us about the past and the future of the English left. The main stage is occupied by the Left Party Platform which identifies with the 1945 Labour government and intends to recreate the ‘spirit of 45’. In opposition was the Socialist Platform linked with the 1917 revolution and wants a revolutionary party to abolish capitalism. Both main platforms reflect an implicit and sometimes explicit British perspective. They are properly called the British Broad Left platform and the British Socialist Platform. These are the politics of the recent past which their supporters want to repeat despite its manifest failures. Fortunately there is an alternative Republican Socialist Platform. This platform uses words not used in the other platforms like ‘England’, ‘Scotland’, the ‘social republic’ and the ‘English Commonwealth 1649’. This may make sense in Scotland but not in England. ‘Strange’ ideas are not welcome in conservative England. The word ‘republic’ is not popular either, labouring as it does under the weight of over three hundred and fifty years of British counter-revolution. The platform will not get much support. But it is the one which will have to be taken seriously and reckoned with not least it relates to a future which is rapidly coming up over the horizon. Meanwhile the Left Party Platform and the Socialist Platform are set to dominate the Left Unity conference like two bald men fighting furiously over a comb. I hope to report to your readers on what happened from a republican socialist perspective on another occasion. Next year will be a big year in Scottish politics. So I am pleased to be invited to speak at the Radical Independence Conference and have an opportunity to express my solidarity and seek your support. Republican socialists in England, the few of us that there are, need your help. As internationalists we must get the working class movement in England to understand the importance of the referendum for its own future. Then we create a virtuous circle by helping each other. The working class movement in England must be shown that this is not a two sided contest between Unionists, parading as internationalists, and Nationalists who want to grab more for the Scottish capitalists in a deal with the US and the EU. If the working class sees this, and only this, they will think a plague on all their houses. In so far as the official Trade Union movement takes sides it will likely go with Unionism as ‘internationalism’ reflecting the politics of the Labour leadership. The struggle around the referendum must come to be seen as a three cornered fight between Unionists, Nationalists and Republicans, the latter calling for a Scottish Republic and the only democratic form of self determination on offer. Any united front between Nationalists and Republicans is surely temporary and confined to the referendum vote. The case for a Yes vote is that although both Unionists and Nationalists are supporting the continuation of the monarchy, a yes victory will provide better conditions to advance towards a Scottish Republic provided the Republicans appear as an independent force and not simply as the tail-end of the Nationalists. The Republicans must therefore present themselves as Internationalists. This is not about nationalists simply disguising themselves as ‘internationalists’. The Unionists will use a bogus internationalism to make their case against narrow Nationalism. But Unionism is internationalism-from-above, imposed on the Scottish people in 1707. Republican-Internationalism comes ‘from below’ by agreements for mutual class solidarity and support. In practical terms it has to be built during the referendum by carrying the message to the trade union and socialist movement in England with the help from supporters in England. There is a final point which I did not include in my talk not least because I have only begun to think about it. Those few of us campaigning for a Republican Socialist Party in England would be greatly helped if a Republican Socialist Party (Scotland) was established. There is surely a great vacuum on the left in Scottish politics since the demise of the Scottish Socialist Party. Although the SSP is still fighting on it is surely a shadow of its former self from the high point before the Sheridan debacle. How can the Republican-Internationalists become a significant force in Scotland without a new party? How can Republican-Internationalists present an alternative to the SNP and act as a beacon for the left in England? 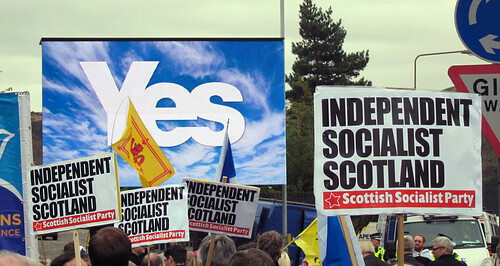 The SSP was a product of the 1997 referendum and the need for the Scottish left to raise its political profile. Surely the same applies today. The SSP was a trail blazer. Now is the time to get back on track but with the emphasis not so much on ‘Scottishness’ but republican-internationalism. A new party should be formed in 2014 if not in time to fight the referendum then to continue the struggle in an ‘Independent’ Scotland. But if the referendum is lost and the movement demoralised, what better time to signal there is another way to another Scotland.